We love analyzing data, but found some of the existing web analytics solutions like Google Analytics too constraining. There were some complex questions about our readers and users that we just couldn’t answer, or required excessive boilerplate. It wasn’t fast enough to iterate on analysis of a/b tests, user retention, and a hundred custom metrics. We ultimately moved to an in-house SQL based system for flexibility, control, and access to the rest of our data, and have been incredibly happy with this decision. We’ll explain how we designed and implemented each of these pieces for our internal analytics system, and show some example queries that this system enables. We also set extra URL parameters on our ad campaigns so we can eventually tell which ads are performant - we look at how to parse out these parameters and segment by ad campaign later on. The next most critical data to collect is conversion data — a signup form submission in our case. Most companies likely already have a database table for this kind of data, so it’s just a matter of logging the same user cookie alongside the form submission. The cookie is how we can connect the dots between the first time we see a visitor, to when they become a customer. We can join web traffic to form submissions, and ask simple questions such as how many pages did a user view before signing up? While we have the raw data, it’d be unwieldy to directly use the pings table for larger queries. A given user may have dozens of pings across multiple days and channels. This is the attribution problem. While more established companies that have many touch points with a potential customer can justify the added complexity of attributing a user to multiple channels, we went with the simpler option of attributing a user to the first channel they discovered us on. Postgres can also use a select distinct on... query, and MySQL can select the min ping id grouped by cookie, then select all pings in that list of ids. Before we use this handy view, let’s also define a cookie_channel view, that will map from a cookie a consolidated channel from a given referrer. Then we can map all pings originating Reddit, Twitter, and Hacker News to a canonical Social channel. In practice we have dozens of rules and both a channel and more specific subchannel columns, but this is a good start. 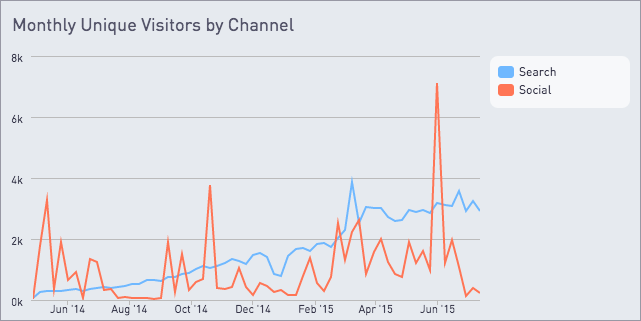 We could make a similar chart for signups by channel by joining from signups.cookie to first_pings.cookie. While it’s great to have all of our signup and visitor data, several important events happen in separate systems. We have a lot of sales data in an external CRM, and it includes great fields we’d like to include. The most important of which are whether a user has had a conversation, a product trial, or eventually became a customer. We setup a cron job to periodically pull the CRM data and reconcile based on the signup email. We match on email because the CRM doesn’t have our domain cookie, but it does have the user’s email. 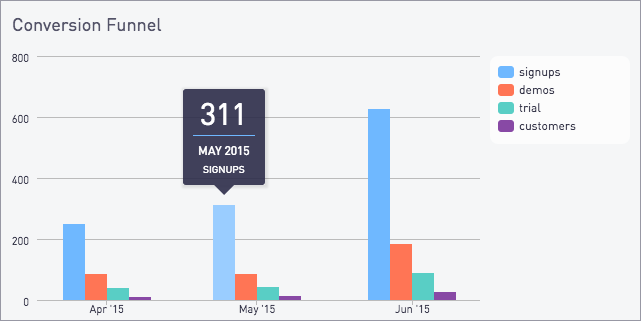 We update a series of these sales funnel bits on the signup table we introduced above. Rather than keeping a current status, we track individual bits — demo, trial, customer — so we can see how far a user got down the funnel, even if eventually they decide to not become a customer. When a user first logs in, we can connect the app account to the user cookie by logging their cookie in the account table, similarly to what we do with signups. At this point we can trace all app behavior (usage, conversion to a plaid plan, upgrade, churn) back to the original visit and channel. else null end) as "Demos"
else null end) as "Trials"
else null end) as "Customers"
Cohort retention is a bit complex, so checkout the above link for the step-by-step details. Basic retention is a bit simpler, especially if you are already familiar with self-joins. We’ll calculate the 1-day retention of webpage visitors, and make use of our cookie_channel view. -- with a one day offset. There are also alternate definitions of retention that are commonly used in mobile game analysis. We covered how to collect the data you need to get started on your own in-house analytics platform, and some of the most common queries. Next, you’ll want to create hundreds of insightful charts about your business. Periscope is a great option if you want to type SQL and get charts and dashboards to share with your team. 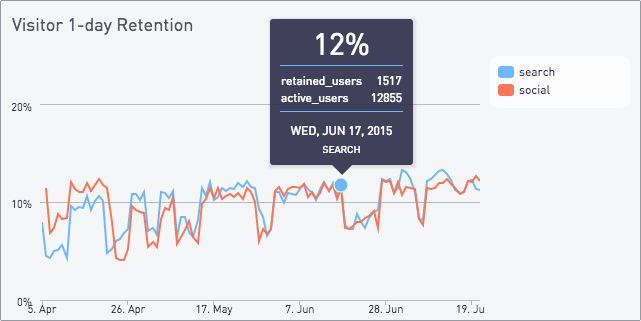 Sign up for a free trial of Periscope if you’d like to try it out on your data.